What are the true Celtic roots of Halloween? The popular imagination (and those ubiquitous articles) generally assumes Halloween to have ancient roots from pre-Christian times, yet when you poke into the origins of the major features of the festival, they appear to have largely begun during the medieval period. 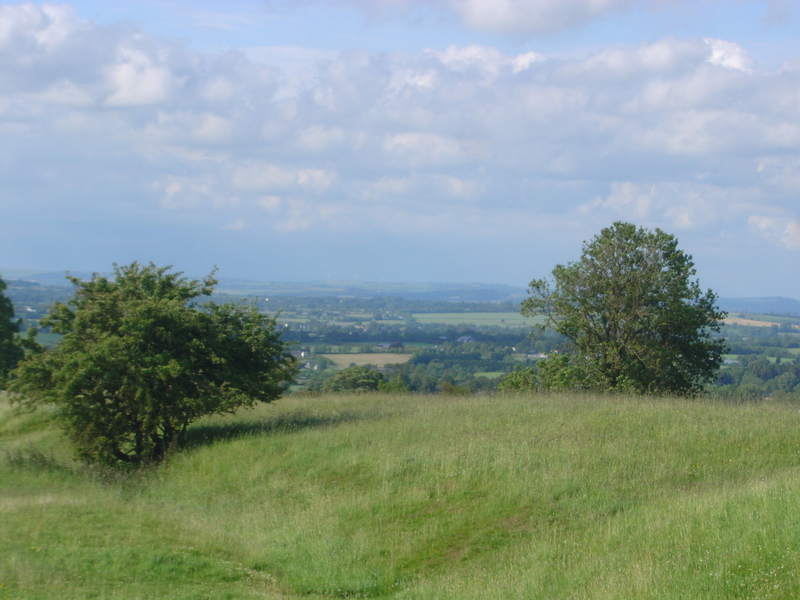 The site of the Banqueting Hall on the Hill of Tara, Co. Meath — One of the tales in the Fenian Cycle of Irish mythology tells how Tara was burned every Samhain by Áillén the Burner, one of the Tuatha Dé Danaan, before he was kiled by Fionn, who then became leader of the Fianna. In ancient Irish mythology, Samhain (pronounced Sow-an) is a feis at the beginning of winter (or, translated literally, at the end of summer — indicating that then, as now, we Irish had a tendency to see the glass as half-full). There are tales of Irish kings and warriors having grand feasts and (as usually happens when a lot of men get together for a serious drinking session) starting big fights or being goaded into doing stupid things. No jack-o-lanterns, no bonfires* beyond that required to keep warm, and no mention of the dead roaming the land. However, while Irish society was very tradition-oriented, we should remember that the chiefs and great warriors were a class apart in this society. There’s no reason why they should not have had their own private drinking session distinct from the general Samhain celebrations. *Although, there is tale in the Fenian cycle which tells how Áillén the Burner, one of the Tuatha Dé Danaan, the gods of the Irish Celts (or possibly pre-Celtic Irish, depending on how you interpret origin myths written down by hostile Christian monks) caused havoc by burning down the King’s dwelling on the Hill of Tara every Samhain until Fionn defeated him. Was this an early “trick” or the start of the tradition of supernatural beings running amuck on Samhain? 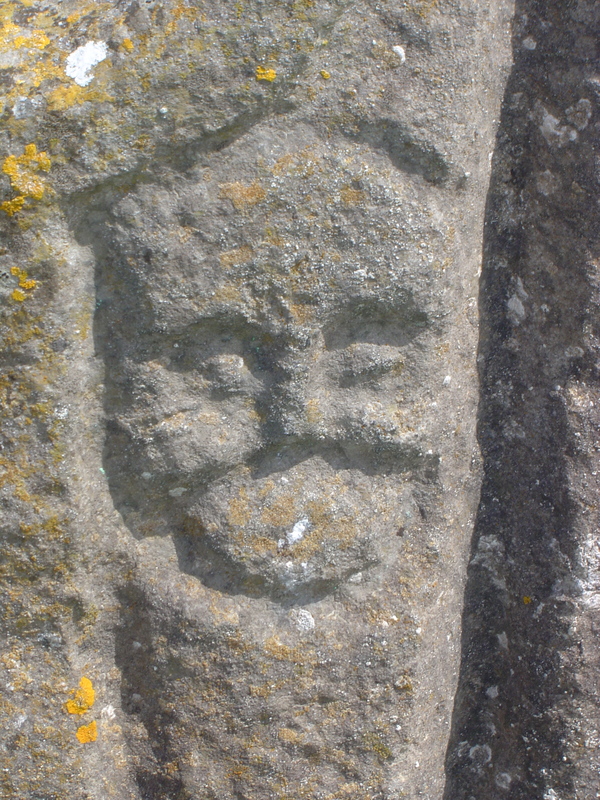 Odd carving found in the 8th Century Churchyard on Inis Mór, Aran Islands. Is this a trickster figure, a breaded man, or an older motif? Samhain is definitely a time of change; one has only to look at the trees to see that. Celebrated as the Celtic New Year (at least nowadays by new age pagans), Samhain is indisputably a “liminal” period when one year ends and the next begins, and a time when treachery and the intervention of supernatural forces are to be expected and feared. Several Celtic warriors and kings seem to have met their downfall on Samhain or had the circumstances leading to that downfall set in motion, so it appears a little ironic that it was viewed as a day of peace in the heroic age. Of course, this does establish the tradition of gods and supernatural beings walking the land on Samhain; but it should be said that supernatural forces were always at work in the prehistoric age (i.e. before history was regularly — if not reliably — recorded) — so, perhaps Samhain wasn’t particularly unique in that regard? 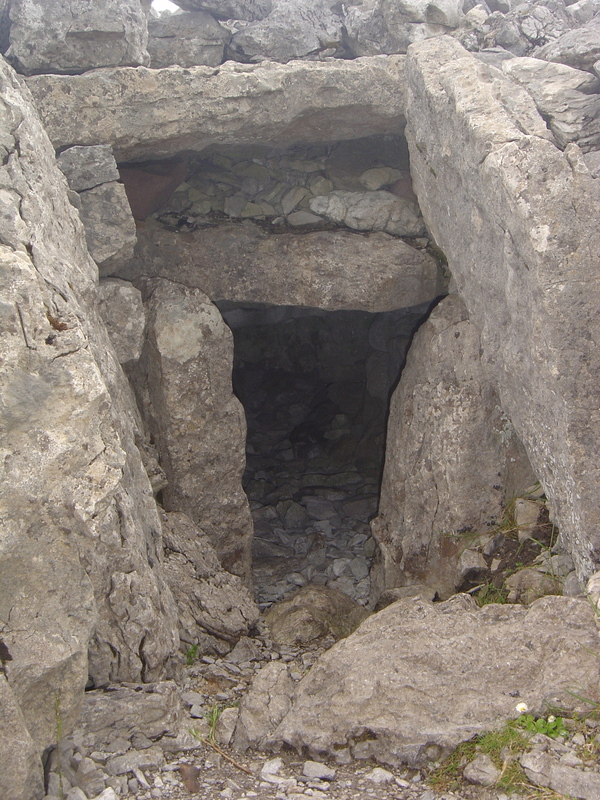 Mouth of a passage grave at Carrowkiel, Co. Sligo. Tradition held that tombs opened on All Hallow’s Eve and the dead might visit the living. To paraphrase something I read recently, these times of change from one thing to another (old year to new, life to death, singletonhood to married) are times of danger: you’ve opened the door to change and anything might come in. So although there may not be a wealth of canonical legend about the dead walking the land, there is plenty of folk tradition. That’s the truth! Still, my theory is I need to get these thoughts out of my head and onto paper in some form or another. Then more interesting thoughts can hopefully take their place. Hope to make it to a write-in soon, maybe during NaNoWrMo? Different surroundings can be good for writing. Fascinating, thanks! Halloween has become all the rage here in Germany, although a few decades agao, when I as an american kid invited all the german kids to a Halloween party, nobody had heard of it.